In a few hours, over 100 million people will plunk down in front of TVs, radios and computers to witness tonight's S*per Bowl (not paying those royalties, NFL! ), but many will argue that soccer (real football) has the biggest sports audiences in the world. Granted, both sides have over-exaggerated their followings (some are estimating soccer generated 250 million for the World Cup, but both sides will claim a billion), but this isn't to say that Japan hasn't had some exposure to football (the American kind). Witness the popularity of Eyeshield 21, which ran for seven years as a manga and three as an anime. Its influence has driven the popularity of its sport, as people have claimed that the number of Japanese kids playing American football doubled between 2002 and 2006, with the manga selling 16 million books for its first 25 volumes. Believe it or not, this isn't the first American football manga; does anyone remember No Huddle? As tasteless as the name may appear now, there was such a contest, and yes, it was played in Nagasaki in 1946. Granted, the game was strictly played by the Marines in Occupational Japan, but about 2,000 of them saw the game played by units serving in Nagasaki and Isahaya. After the Nagasaki Bears took a 13-0 lead, the Isahaya Tigers scored twice to win the game 14-13. A second game was never played. This bowl game is played by teams from the Japanese collegiate system since 1946 and is played at Kôshien Stadium, the site of the two yearly high-school baseball tournaments. While there are not many colleges that participate in the league, there is still a pretty good following, and the game even gets national attention on sports shows. 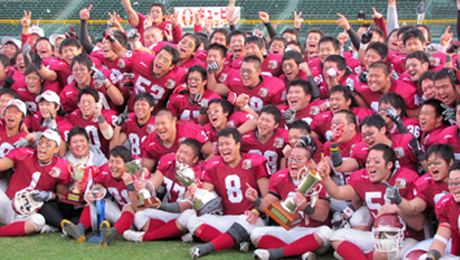 While Kansei Gakuin University and Nippon University have dominated for years, winning 19 and 18 of the the championships, respectively, this year's Kôshien Bowl had the Ritsumeikan University Panthers demolishing the Waseda University Big Bears, 48-21. The "X League", Japan's semi-professional American football league, takes its structure much like the J League has its structure, but the road to the "Japan X Cup" is a little rockier. There are four "X Division" tiers, with the top tier ("X1") competing for the title. Each of the top three divisions are divided into three groups, with each division holding 18 teams. Interestingly enough, however, the groups are not static within the X1 division, and teams in the "East" and "Central" blocks can be shuffled. This year, the Obic Seagulls defeated the Panasonic Denkô Impulse in the 2010 Japan X Bowl, 20-16. Mind you, we're not exactly seeing athletic perfection here; the Nagoya Cyclones scored a total of three points the entire season (in 5 games, they were outscored 109-3). Hard to believe, but the Rice Bowl does exist. Actually, in a game that would perhaps never be played in the United States, the Rice Bowl pits the winners of the Japan X Bowl and the Kôshien Bowl against each other. That's right; college vs. professional. The bowl itself used to be played as a college all-star game in 1948, but starting in 1983 the game was played between the best teams in the college and professional ranks. Unbelievably, there have been three teams that have won the Rice Bowl four times, and two of them have been collegiate teams; Kyôto University and Nippon University. This year, Obic became the first professional team to win the Rice Bowl four times, defeating Ritsumeikan University, 24-0. Did I suggest this to you? After I started watching Eyeshield 21 I started wishing there was a resource exactly like this, since the information available on Wikipedia was less than satisfying. Either way, thanks for doing this! Nope. To me, Japanese football has always been interesting to me. Didja know that an ex-yokozuna sumo wrestler once tried out for the Bengals? It's true!